Beauty and serendipity aren’t necessarily correlated. You may be familiar with the Golden Ratio, the Rule of Odds, or the Rule of Thirds. These concepts seek, in part, to explain what our brains find attractive when we see a thing. It should come as no surprise, then, to find that motorcycles also have a little science behind them in terms of what looks “right” to us. In this article, I am concentrating on custom bikes. In general, someone in a shed or garage making one precious keepsake has more freedom than the teams of folks dealing with budgetary, legal, and manufacturing constraints, but there are plenty of lessons to be taken from factory machines, as well. While these aren’t hard and fast “rules” we're going over here, these are some concepts that might help you figure out how to make your own bike just so, if you're customizing, or help you understand why you like what you like, if you're just looking and admiring. 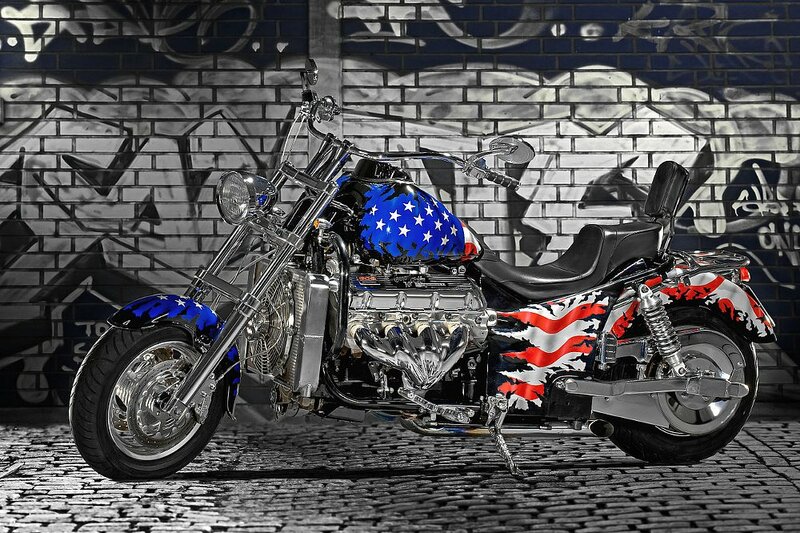 Our very own Joe Zito built his chopper many, many moons ago. But this bike still looks fresh and classy because the lines are just right. Look how leggy this bike appears — that's because of the tall hoops and skinny tires. Also notice all the air in front of the engine, under the carbs, and under the oil bag. That was a look he shot for; it was not accidental. Photo by Joe Zito. A small-diameter wheel is generally fitted with taller, wider tires, lending a chunky look. It's been taken to an extreme on this bike, which gives it a decidedly rough, tough, off-road-esque appearance more than a large-diameter hoop and slim tire could. Photo by Lemmy. Motorcycles almost all have a pair of wheels, and their relationship to each other and to the rest of the bike is an important visual determinant in the feel of a bike. These relate a bit to the elements of art known as shape (two-dimensional, so think about the profile of how a motorcycle might look) and form (three-dimensional, so consider basically all the other angles). Wheels determine tire choices, they also govern a bike’s stance, and they contribute to factors like trail and ground clearance. Wheel diameter is often dictated by total motorcycle size. Metric cruisers, for example, often use 15-inch rear wheels instead of a more conventional 16-inch wheel because the bikes are often significantly smaller than a traditional heavy cruiser. In general, a larger diameter wheel will be paired with a tire having less width and sidewall height than a smaller diameter wheel, so when builders are trying to achieve a leggy look for a motorcycle, they’ll often choose a wheel that’s larger in diameter. Spoked wheels often appear visually lighter than cast wheels because observers can more easily see through them. A little difference in size can provide an interesting look, too. A small, narrow front tire and wheel combo paired up with a wide, tall rear can help a bike sit aggressively (and is sometimes chosen for its effect on trail). It's evocative of a dragster, and can make a motorcycle look almost as though it's crouching, ready to pounce. Note the 23-inch front wheel paired with the small rear. Too big, or does it look good to you? Photo by Dan Venditto. Custom choppers frequently use wheels of fairly different diameter because the oft-chosen springer front end can look exceptionally delicate, and pairing a tall, skinny hoop, like a 21-inch spool wheel, can help accentuate that skinniness, concentrating visual (and actual!) weight to the rear of the motorcycle. Sometimes, though, a big difference in wheel diameters isn’t pleasing to everyone’s eye, like a 23-inch wheel paired with a 16, or an 18-inch rear paired with a narrow 17-inch front. (And plenty of people don't like that "big 'n' little" pairing mentioned in the previous paragraph.) Styles have gone in and out over the years, and many customs sport tires of reasonably similar outside diameters (even if the rim size is different). There's no right or wrong answer here, but tire and wheel combos are critical to achieving certain looks. For instance, if you wanna build a flat-tracker, dual 19s are pretty much required. The farther the builder strays from that recipe, the less the end product will feel like a dirt-track bike. I'm gonna pick on Indian for a moment here. Look at how poorly the rear fender follows that rear wheel and tire curvature. Indian photo. Closely related to the wheels is the fender. Generally, fenders that look good follow the circumference of the tire, and the most appealing look is often to have the fender as close to the tire as practicality allows. Radiusing is an important job done on most custom motorcycle fenders, especially the rear. Unlike the front fender, the rear usually does not move with the wheel on a sprung motorcycle. Tightening a fender's radius can be performed by spreading the fender wider, which tightens the curve, or by making a series of cuts in the fender, and rejoining them after the fender is massaged into the correct arc. Conversely, narrowing the fender with pressure applied from the outside in will cause the radius to loosen. ...but they redeemed themselves on the Bobber version of the same bike. Part of the reason nearly everyone seems to like this iteration of the Scout better has to do with the rear wheel and fender relationship. Look how nice that looks comparatively; the arcs complement one another beautifully. Note that making this match up, especially on a bike with rear suspension, is easier with a shorter, shallower fender. Photo by Barry Hathaway. When it comes to fender placement, a rule of thumb for rigid bikes has been to lay a drive chain over the rear tire, set the fender upon it, and then mount the fender in that location. That leaves juuuuust enough room to deal with tire growth. The length of the fender needs to be taken into account, too. Depending on how far down the back of a tire a fender comes, the fender may need to stop following the line of a tire due to the need for axle adjustability as the motorcycle’s chain wears. Note here how the fender still follows the tire circumference very closely. Achieving this look on a bike with rear suspension requires a creative solution. (In this case, it was rigid struts, which make this rear setup look harmonious.) Photo by Dan Venditto. On sprung motorcycles, a variety of tricks are employed to make this work. Sometimes you’ll see fenders mounted to swingarms to move with the tire, allowing much closer mounting than could usually be achieved. Often you’ll see tails chopped very short, to avoid having to have a very close match, and sometimes you’ll see straight or flat tail sections incorporated to fool viewers into seeing the fender more as a component of the bodywork than as a piece of the wheel. Many modern sport bikes utilize this to great effect by having a separate “hugger” that’s a neutral, forgettable color blend into the wheel, with a more dramatic tail section worked in as part of the body that doesn’t serve to do anything other than provide a pleasing cover for the subframe and convenient spot to mount a taillight and tag. Note the subtle "hugger" over the rear wheel, which separates the duties of guarding the rider from spray and beautifying the rear wheel. The hugger keeps the rider clean, and the tail section is just employed to make the rear subframe attractive (and in the case of some customs, suitable for pillion use). Photo by Gareth Squance. You may also see fenders that are aggressively “flipped” at the rear to allow a builder to use a short fender that provides an alternative arc that is aesthetically pleasing. The classic example of this is the commercially available quickbob fender that hailed from riders cutting the rear of a front springer mudguard, and mounting it onto the rear of a motorcycle, rotated far forward to provide a unique look. A motorcycle’s frame obviously carries the necessary components of the bike, but in some cases, it can also serve as an important visual element. In others, it’s almost completely hidden. Frames have so many different tasks, are constructed of so many different materials, and can be made of such varying shapes and sizes that it can be hard to nail down very many specific rules, but we can toss a few out there that may help you understand why you like what you like. Here's a CAD drawing of a modern Indian Scout frame. That bike handles well and far outclasses a frame of old, but this does present serious customization barriers, The large cast aluminum spars are difficult to tackle with home welding setups. The dual backbones make tanks that are narrow port-to-starboard or short fore-to-aft difficult to use. And the broad, flat sections can appear visually dominant depending on what is pared away. The frame is certainly superior in terms of performance, but new frame architecture may prove difficult if deviating from a factory motorcycle design. Indian Motorcycle image. Frame material matters a bit here. Generally, runs of round tubing tend to look “nice” to human eyes, whereas square sections do not, unless a builder is shooting for a specific look. You can see this a lot in modern motorcycles that have square backbones: the fuel tank is usually long enough to cover that section of tubing. (A good example of this would be the Triumph America.) Smaller diameter tubing is usually of a fairly thick wall, and steel is often the material of choice. Even though the perimeter frame on this ZX-10R is kind of enormous, the color of the frame and the diagonal lines of the fairing and fuel tank help it blend in and not be visually dominant. Kawasaki photo. Similarly, large, flat pieces tend to be unappealing, and those large swaths often come from voluminous aluminum: light, but made from large sections to add strength. Examine the boxed aluminum perimeter frames found on modern sport bikes: they’re often formed with graceful curves flattered by the bodywork, and contours are often formed into the metal to break up the monotony and draw the eye elsewhere. Muted colors (often black) are used to help the frame disappear a bit. Here's a custom by NCR. Note how the trellis commands your attention. It is clearly an item of great strength and yet it is visually very light and airy thanks to the open structure of the trellis lines. Note, too, the difference is made more apparent by the finishes used — we'll get to that in a different section. NCR photo. A traditional frame, made of tubing, often serves as a perimeter, or a visual border. Think of them as the lines in a child’s coloring book. (Line is another element of art.) On a rigid frame, for instance, a nice long, straight unbroken line from the headstock down to the axle is a look many riders shoot for. That line is for many a defining element of the style. Similarly, trellis frames are often seen as items of beauty, which makes sense. In addition to serving as a border for the edges of the motorcycle laterally, they also create pleasing geometric shapes (usually triangular). The trellis signifies its inherent strength, and each triangle individually inherently obeys the Rule of Odds mentioned earlier. Note the open area behind the carbs, where the bike's airbox used to live. Does that much open space turn your crank, or does it just appear something is missing? Photo by Lance Oliver. The frame can also define space — another element of art, including negative space. Have you ever seen a cafe racer with a big, open triangle in the frame? 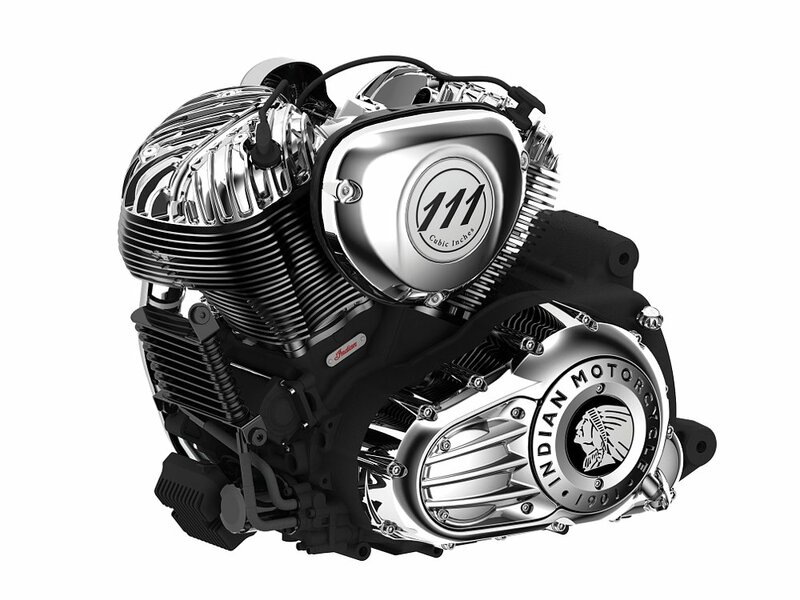 Many builders remove the airbox and achieve this look. Similarly, if you ever compare an older Triumph custom with a Harley-Davidson, you’ll notice far less space between the frame on the Harley than the Triumph, in most cases. Are those negative spaces good or bad? Depends on your viewpoint. Some love the airy look of a cafe or Triumph, and others prefer the bulging appearance of the Harley. No matter your stance, the impact of the frame on space (or lack thereof) is certainly great. The frame also imparts a sense of movement, a principle (not an element) of art. One of the best articles on custom bike design theory I ever read was a Bikeexif article penned years ago by Charlie Trelogan, an automotive designer. In it, he mentions the foundation line. On a cafe motorcycle, the subject of the article, that line is the horizontal line that’s nearly parallel with the ground, that’s usually heavily emphasized (ideally!) by the flat line of the tank's underside continuing into the flat line of the seat. Those items are borne by the frame, so making them work organically together makes good visual sense. Look at that straight line from headstock to axle. See how nicely everything flows along that? Bends in this area, especially sharp or severe ones, can really make a bike a bit unsettling optically. Photo by Lemmy. On a rigid bike, especially one with a shorter wheelbase, like a Triumph that’s been hardtailed, the foundational line is the line from headstock, down the spine, and onto the rear seat stays, out to the axle. Almost every custom frame tries to shoot that line as straight as possible, and on bikes that “look right,” that line, if bent or broken, will usually use the fuel tank or seat to hide the bend if possible. The relationship between these three lines is pretty important. The closer to perpendicular (to the ground) they are, the "racier" a bike will feel, whereas more relaxed lines that deviate from perpendicular give a laid-back, easygoing vibe. Photo by Dan Venditto. In addition to serving as a visual perimeter and a foundational line upon which the rest of the bike is imagined, the frame can serve some secondary geometric purposes, as well, kind of like that trellis frame we mentioned earlier. 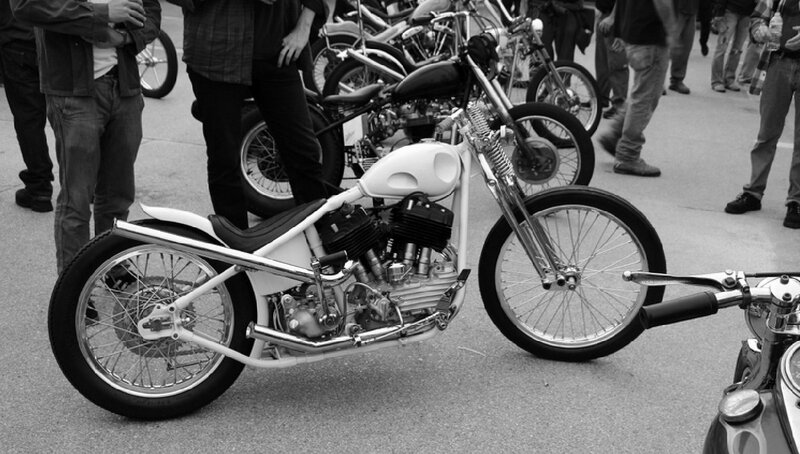 On choppers, for instance, the angle of the seat tube influences the front fork rake and the sissy bar angle. Generally, those three lines need to complement each other because they affect that principle of movement. A bike with an extreme fork angle and a very upright sissy stick looks “off” to most eyes, and the opposite is true, too: A bike with a fairly short front end and little rake looks odd with a very “laid-back” sissy bar. Some try to match them completely, and others like some tension between the angles, but there is a relationship. "I am bummed about the trend of most bikes not having a legit tail section anymore. Even the late-'80s boxy sport bike tails look rad," said Joe Zito, our in-house custom expert. I agree with him. Bodywork has come to define motorcycles, time periods, and style trends, as his comment points out. Photo by Lemmy. It's 20 years old, so the 'Busa might seem a bit stale. But the Hayabusa's plastics, which are immediately identifiable even just in profile, are iconic. Suzuki photo. Without going too deeply into this category that could (and has) filled books, bodywork can both define and obfuscate a motorcycle. Something like a Suzuki Hayabusa or RF900 is defined by the shapes suggested by the bodywork. (I mean, all factory bodywork started as a prototype, which is in effect a custom!) But in the same breath, countless streetfighters, café racers and choppers have emerged at the hands of an owner who peeled back layers to find an item of beauty within. Or imagine, if you will, dirt bikes and dual-sports, with their sparse bodywork. A round front fender and a square headlight was once the mark of a cutting-edge motorcycle, but now is a vintage look — modern dirt machines have angular plastic residing over the front wheel, and headlights are usually shapely units that take advantage of capsule-style headlight bulbs, and the results feel futuristic when placed next to an older machine whose parts serve the same function. The tail of a Kawasaki Z1 is legendary at this point. It's almost a teeny bit too long, but not ridiculously so — part of why it's immediately recognizable. It's really a very small piece of bodywork, but it's an absolutely essential element to achieve the look of that motorcycle. Don't believe me? Go look at the retro Z900RS Kawasaki released, and see how very closely they tried to capture that look. Photo from the Wayne Schmeekle collection. Similarly, the principle of art known as proportion can really take hold with bodywork. Frames, engines, and transmissions are reasonably fixed in terms of size for most builders. However, choosing a too large dustbin fairing or a tank that’s too narrow or short can make a really neat bike look very odd. Some builders will “play” with proportion to emphasize, say, the largeness of an engine or the delicate construction of a frame, and that level of thought in mock-up usually leads to a great outcome, but ill-chosen body pieces can make motorcycles look bloated, droopy, or bulky — and it might take you a bit of examination and staring time to figure out why you feel that way. For as much time as a custom builder might spend smoothing frame welds or polishing an engine case, the reality is those pieces often get lost in the shuffle. You may never see that weld or the shiny part of that engine when the bike is assembled, but some items command a lot of your eye’s attention, even if it’s subconscious. Here's a perfect example of a ton of different finishes cohabitating on a Harley-Davidson Fat Boy. The engine is wrinkle black, with polished fins. The two-piece rocker boxes mate chrome with a satin finish, and the pushrod tube covers and lifter blocks are chrome, juxtaposed with a satin cam cover. Pipes are satin, next to gloss black frame paint, and then two glossy metallic paints are used on the tank, with a solid pinstripe, capped off with a chrome badge with black and white paint on it. And yet this motorcycle looks completely cohesive. Crazy how that works, isn't it? Photo by Brian J. Nelson. Here's a bike by Exile Cycles. I've always admired Russell Mitchell's attention to finishing detail. First, notice his use of gloss paint with satin metal everywhere; that look is very much a signature of his. Another is the clean, clean controls. Look... no clutch cable. Heck, there's no clutch lever! (It's a twistgrip unit, like a throttle, and Exile makes about the finest one in the land.) The throttle cable and wiring are only barely visible if you're looking for them. Other than the front brake line, it's dang hard to see much other than the bike's structural elements. You might assume this bike wouldn't even run without seeing that stuff! Even if the style is not your speed, it's hard to argue with how sanitary the bike looks. Exile Cycle photo. Another small touch is a negative one: what you don’t see. Some things are simply distracting to the eye: cables, wiring and plumbing are frequent suspects. Bikes that look “clean” and uncluttered generally have that appearance for a reason. Internal throttles, internally wired handlebars, microswitches, and shaved fork legs all came about because builders were attempting to emphasize structural lines of the bike and minimize distractions. And do the parts look like they know each other? We don't want parts of a bike to look like strangers. Mixing old and new parts often takes some finesse, so the bike still feels unified. Similarly, on a well weathered motorcycle, acquiring parts that have similar wear levels (or faking it!) often helps. Flame, acids, dirt, grease, and oil can all help a rookie part look like a veteran piece. I recall a custom builder I know well using cheap Wal-Mart spray paint on an outer primary, and then spending some time kicking it around his gravel drive with his children in a bizarre form of soccer — but it looked right at home once it wound up on his race machine. We’ve just scratched the surface of what your local garage rat could be thinking when he “tosses together” another bike from parts that didn’t cost a ton, but might look really great. Generally, a well planned project with half-decent execution will look pretty killer, and now you know a little bit about what the pros think about when they’re formulating their plans. These aren’t rules, so to speak, but instead concepts that have worked well for many years. Much like poetry or music or any other creative endeavor, blowing past one or more of these rules is possible, if someone has either the skill or keen eye to do so, so don’t be surprised if you love something that’s “wrong.” That’s part of the game. And you also know that they’re thinking about what you’ll be thinking. Perhaps you've learned a little something about why you’ll think it!